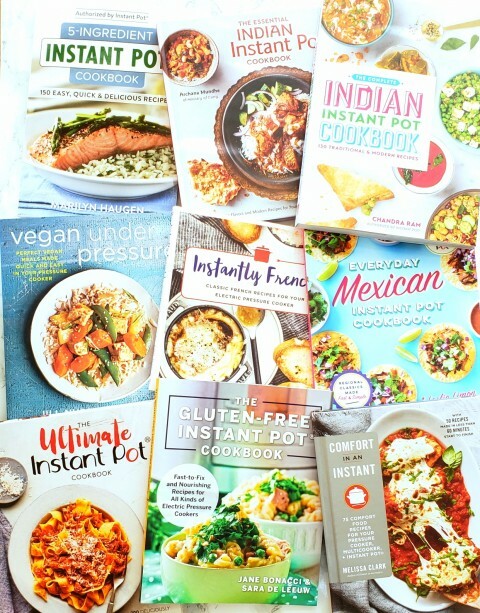 A plethora of Instant Pot cookbooks out just in time for gift-giving make a nice present for any home cook. 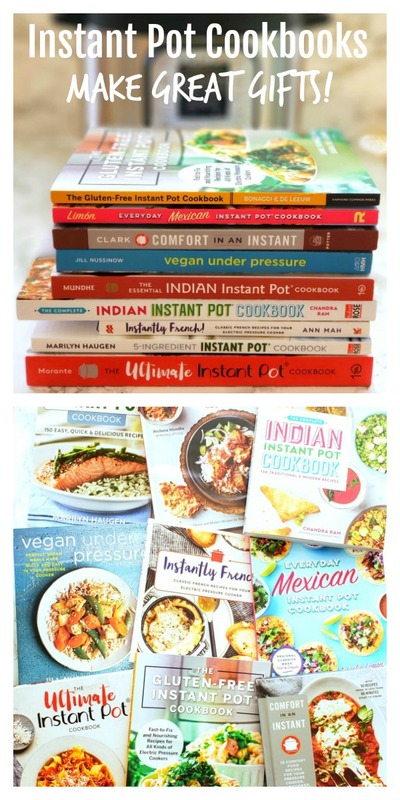 And for those who don’t have one, how about the gift of an Instant Pot AND a couple of these cookbooks? The Instant Pot  swept the field last year for gift-giving, and it is still going strong. If your household has an IP, how about giving one or more of these new cookbooks for gifts? The will have your taste buds ranging all over the globe, from India to Mexico to France. There are books for gluten-free folks, vegan followers, the 5-ingredients crowd…there is something for everyone! I’ll tell you a bit about each book so you can figure out which ones are right for you. “Comfort in an Instant ,” by Melissa Clark, a writer for the New York Times Food section, is her second Instant Pot cookbook. Her first, “Dinner in an Instant,” came from her exploration of why legions of passionate home cooks fell hard for the electric pressure cooker. She finds these multipots excel at comforting dishes like turkey meatloaf or cumin-scented Cuban chicken and rice. I have my eye on her Pesto Risotto with Cherry Tomatoes and Mozzarella. Cannot wait! 75 new recipes, 50 of which can be made in less than an hour, start to finish. $22 retail; $15 on Amazon . “The Ultimate Instant Pot Cookbook ,” by Coco Morante, bills itself as your one-stop source for tried-and-true classics like rich beef stew, crustless quiche Lorraine and chocolatey fudge brownie cake. I couldn’t take my eyes off her Porcupine Meatballs, which look so succulent yet cook in half the time of the original (oven) recipe. $30 retail; $30 on Amazon . “The Gluten-Free Instant Pot Cookbook: Fast to Fix and Nourishing Recipes for All Kinds of Electric Pressure Cookers ,” by my food blogging pals Jane Bonacci and Sara De Leeuw, is the answer if you eat gluten-free, either by necessity or choice. Pressure cookers allow you to cook fruits, veggies, fish, meats, beans, rice and alternative grains in no time at all. It includes 50 recipes and a truly useful primer on working with your pressure cooker; Sara is a cooking teacher, and Jane is a cookbook author, so they have cred. First up for me is their Cheesy Poblano Frittata, for breakfast, lunch or a light dinner with a salad. And their Lentil Sloppy Joes? I am ALL IN! $20 retail; $13 paperback on Amazon . Who doesn’t love Mexican food? “Everyday Mexican Instant Pot Cookbook: Regional Classics Made Fast & Simple ,” by Leslie Limon, who draws from her experience being raised by her Mexican grandparents, and having lived in Mexico for nearly 2 decades. This is for those who want to explore more than tacos — stews like menudo and pozole, roasted meats like Cochinita Pibil and barbacoa. Rich, one-pot meals called guisados, staples like frijoles charros, and even Cal-Mextwists like Mole Pulled Pork Sliders and Chile Relleno Chowder will keep your taste buds amused. First up for me will be the Arroz Con Pollo. $17 retail; $14 paperback on Amazon . Now we go from Mexico to France…”Instantly French! Classic French Recipes for Your Electric Pressure Cooker ,” by Ann Mah, is the first book dedicated to French cooking using an electric pressure cooker. More than 70 recipes here include Roquefort Walnut Mini Quiches, French Onion Soup, the classics boeuf bourguignon and cassoulet, and even Poached Pears with Chocolate Sauce and creme brulee. Want traditional French flavors in half the time? I do. $25 retail; $17 paperback on Amazon . “The Complete Indian Instant Pot Cookbook: 130 Traditional & Modern Recipes ,” showcases the fresh, exciting flavors of Indian food by Chandra Ram, a first-generation daughter of an Indian father and Irish mother. She trained at the Culinary Institute of America and cooked in restaurants before turning to food writing. She found that time-sucking cooking projects like making yogurt, leavening bread dough and braising meats are suddenly do-able on a daily basis in a pressure cooker. Biryani in 30 minutes, turning hard lentils and rice into smooth stews and curries, Coconut Cilantro Chutney, Orange Cardamom Cheesecake…I am ready for all of it! And the photography here is just gorgeous. $25 retail; $16 paperback on Amazon . “The Essential Indian Instant Pot Cookbook: Authentic Flavors and Modern Recipes for Your Electric Pressure Cooker ,” comes to us from Archana Mundhe, who writes the blog Ministry of Curry, which is focused on making cooking international cuisine approachable for everyone. Her Chicken Cilantro Soup, her Paneer in Spinach Sauce (a dish I will also order when dining in an Indian restaurant), and her Mixed Vegetables in Tomato and Cashew Sauce are so gorgeous and appealing on the page that they are on my menu for next week. I could seriously work my way through the 75 recipes in this pretty book, with no boredom in sight. Lemon Pickle, anyone? $20 retail; $12 on Amazon . Some of my most memorable meals were thrown together with just a very few ingredients, so I am already on board for “5-Ingredient Instant Pot Cookbook: 150 Easy, Quick & Delicious Recipes, ” by Marilyn Haugen. Beer Cheese Soup? Why yes, don’t mind if I do! Make-and-Take Quinoa, Lentil and Cucumber Salad sounds perfect for a work lunch, and Tender Chipotle Chicken sounds good not only for dinner, but for leftovers the next day. Marilyn wrote a previous Instant Pot bestselling cookbook, so she knows her stuff. $20 retail; $17 paperback on Amazon . I have the Instant Pot 6-Quart Duo , which is a great all-around size, very practical and a good price at under $100. Suit yourself as to what size you get. If you like this article and want to save it, pin the image below on your Pinterest board.